This is not a videogame system but an educational toys made by Sega. Similar in conception to the better known Pico system, this is an electronic learning aid that (but I am not completely sure) wasn't linkable to a TV set. It was a stand alone system with no graphics but with sounds. This was obviously targeted to kids. It seems that a similar products was also produced under the name of Electronic Comic Book and that it was targeted to older kids. Wonderbook was produced by Sega together with a US company called RKS. The system in all its glory. Obviously you could change the storybook to play new "games". 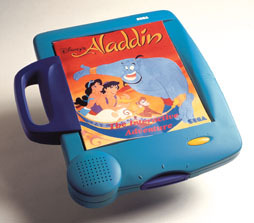 Like with Pico many titles were based on popular Disney characters like Aladdin. This product combines a story book with computer technology for a unique interactive learning experience targeted to 3-7 year olds. A companion product (Electronic Comic Book) uses the same technology and form factor, but a different color treatment to target the 7-14 year old segment. As far as I know the system was distributed only in North America by Sega themselves. NOTE: I am looking for more informations/pics on this system (Sega Wonderbook) and on the similar Electronic Comic Book system. If you know more, please send me e-mails here! They collaborated with Sega to design the system. The system appear on their web site!